In 1964, the media could easily convince the American people that the Vietnam misadventure was "necessary." The media could still sell the American people that the Iraq misadventure was also "necessary" in 2002. In 2016, the media went "all-out" to sell the inevitability and rightness of a Hillary Clinton presidency. What should have been a slam dunk ended up in defeat. Simply put, democracy requires citizens to be skeptical and street-smart. Chumps who can't figure out when they're being played will lose their democracy. It's been about 10 years since I unplugged from the MSM. It was right around the time of the 2008 Financial Collapse when they were trying to sell the so-called "Great Recession" to the global public. When in reality the world entered a Global Depression, which is probably why the World's Central Banks are doing their best to kill deflation before it gets out of control. Now all my news I get from the alternative media which includes this site, James Corbett, USAWatchdog.com, Geoengineeringwatch.org, Zero Hedge and others. Another site I follow pointed out that St Loius FRED chart for the adjusted monetary base shows the dollar in a slow deflationary process over the last few years. So all this talk about tightening the dollar is smoke and mirrors unless the FED is so anti Trump that they want to cause a recession/depression on his watch. Sneaky, sneaky. It is true that mainstream media support of weak candidates has often succeeded in getting them elected. It is also true that the major metropolitan newspapers and older TV networks were heavily one-sided in their support of Ms. Clinton. But that is not the same as saying that Mr. Trump lacked significant media support. During the campaign period I noticed that in many places where a TV runs continuously while customers wait, such as doctors offices, auto service shops, restaurants, etc, the choices were pretty evenly split between CNN and Fox News. While CNN was heavily biased in favor of Clinton, Fox pundits were generally supportive of Trump. Love 'em or hate 'em, maybe what really happened here is that Fox has become a much more important source and a counter to the MSM. Quite a while back, I started to sample non US news sources to get news not readily available in the US, as well as reports with a different bias. The idea is if, I read news on a particular topic from US, Europe and Eastern news sources, hopefully the individual biases will cancel themselves out. I think we failed to keep it. The largest "fake news" story was run by the msm in 2003. The story of the weapons of mass destruction in Iraq in order to persuade people to support enforced regime change in Iraq was shown to have been totally fabricated, with devastating results that are still being felt to this day. The msm has never recovered in my view. When they tried it again with their Assad chemical attack fake news, enough British people were skeptical for the British parliament to vote down direct military intervention in Syria. Without Britain's support, the US also backed down. People in the West have wised up to the fact that the msm is just the propaganda arm of the government when it comes to geopolitics and is no different to the state run media in Russia, China etc. When the elites realise that they have lost control of the narrative they will either get rid of the independent media, not possible in this internet age, or try to get rid of any pretense of democracy. It's up to all of us, not to let either happen. The ultra wealthy won the Election and insured that Bernie did not ! 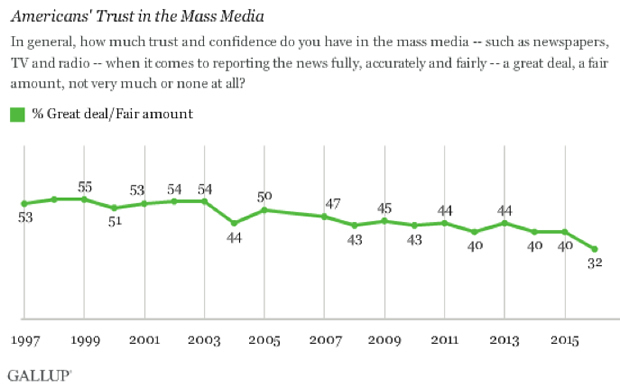 Charles, any idea why our faith in the MSM took a hiding in 2004, and then recovered quickly? (your chart). I remember 2004 being relatively quiet, with most of us sharing cocktails among one another on the back verandah & singing Kumbayah (proverbially speaking). I'm wondering if the blip in media credibility was due to Abu Ghraib, with a severe setback to our trust in the "authorities". If so then the media may have suffered by association. "Nobody believes a liar - even when they are telling the truth." - Excerpt from "The boy who cried wolf"
Look, I am a real fan of Amazon's services, but Jeff Bezos is beginning to worry me. First his WaPo runs with the dangerously inflammatory and inaccurate "Russian Dupes" fake news theme and then only grudgingly prints a half-assed retraction of sorts which was really more of a clarification ("hey, probably we'd run the article slightly differently if we could do it over again, but we'd still do it"). Now Bezo's company is pimping one of its original series with a large Times Square billboard. The series is a "what if" plot asking how America would have been if we'd lost the war against Hitler's Germany. Take one quick peek at that billboard and you cannot help but guffaw at the rank anti-Trump propaganda on display. Look, I know that Bezos is still unhappy about the election and all, as are many others, but I do think this level of moral demonization is dangerously over the top. Disagree all you want, but make your points openly and with careful dialog. This underhanded psychological manipulation is really unflattering and seems unhinged even. After all, what would be the desired effect of subtly undermining Trump by associating him with Hitler...or Russia? To get people to turn against him and withhold support? Okay, then what? What does that buy you? Because whatever you gain by that route seems to be substantially less important or useful than the danger that comes along for the ride, which is a morally divided populace...aka the seeds of actual rebellion and civil war. He's playing with fire is what I'm saying, and I wonder if that's actually appreciated? For the first time, agencies within the IC will be able to order a variety of on-demand computing and analytic services from the CIA and National Security Agency. What’s more, they’ll only pay for what they use. U.S. intelligence agencies moving from legacy systems to new cloud computing infrastructure built by Amazon AMZN -0.02% Web Services are pretty happy about it thus far, according to a report in NextGov. For the record, I don't actually condemn the notion of Amazon Web Services for offering this service, because from what little I know the intelligence community as a whole badly needed to revamp their approach and use of IT services (as to whether Amazon is the most competent vendor and whether this particular cloud services approach is best, I can't really say). But I do have concerns with such a very large company growing to be a critical player in that field, when it just also happens to be heavily invested in mass media, AND is rather heavily involved in politics. Has the stench of an empire being formed. For me the MSM died when Obama became POTUS, policies stayed the same and some more, but MSM criticism stopped! Then I knew it was ALL B.S. So as a user of AWS (Amazon Web Services), I have to say, it really is the coolest thing ever. If I want to spin up a server pretty much anywhere in the world, I can - it takes me about ten minutes (mainly because I'm not very good at it - if I had a template already set up, it would probably be two or three minutes) and presto I have as small or as large a server as I want. If they aren't using something like AWS, they are idiots. It is just too well done. You too can play with AWS if you like. Anyone can just sign up, and they can have a "t2 micro" server, sited anywhere in the world, free for a year. Although its a "micro" server, it is actually a reasonably beefy box. You just get allocated about 10% of the total CPU-minutes of that server per day and when you run low, your jobs just slow way down. Sorry for the digression, and to sound like a commercial, but AWS really is pretty nifty. Dudgiknow that a 3rd tower fell on 9/11? T2H, I heavily disagree this was a false flag. All this really happened. Your take on a false flag seems to be that they are actors. There is no need for actors if it really happens. Look at what went on the the Polonium murder of Litvanenko. He was supporting the claims of Boris B. that --not that the terrorist attacks didn't happen, not that the Russian secret service did it, but that they pushed for it and allowed it to happen. No crisis actors needed. In the same way, if these events were false flags or not, no crisis actors are needed. I think you falsely assume that they must be there. As for whether this was arranged in Turkey or not, I have no idea. I'm NOT GOING to have any idea. Neither are you. Nature of the beast, and all that. Accept the reality that you aren't going to know, that you aren't going to be able to tell, and you'll quit wasting valuable psychological energy on it. Still stinks to high heaven. Mainstream media pushes the bias of their controllers. Alternative media is currently degenerating into a rumour mill that is overly reliant on opinion and light on original reporting. How many people with blogs hit the streets and do actual interviews outside of their echo chambers? Just because mainstream is completely unreliable doesn't automagically make alternative media, right or left, worthy. There is pollution there. Chris, are you being ironic or just very inconsistent? I have taken a step back from commenting at PP due to some things about the site that bring it further away from its mission statement, of "creating a world worth inheriting,"
2. A significant amount of "air time" on politics and geopolitics by you specifically and less of a focus on your brilliant core message of the three E's and constructive responses, in spite of the fact that you have made some glaring errors in political/geopolitical analysis (e.g. the Brexit outcome, believing fake tweets, misidentifying Janukovitch's political alliances, characterizing Utah state senator Ken Ivory's call to give Utah control of low-EROI shales of Utah as a type of federalism, instead of the legislative facet of a corporate grab promoted by ALEC). This is in spite of the fact that the geopolitical talk is, for the most part, impractical, unproductive and divisive. Whereas I have seen you rightly espouse the benefits of being practical, productive, and consistent in different ways. This comment about Jeff Bezos's media is a good example of how clumsily you wade into politics. The right compared Obama to Hitler repeatedly, and also, if I'm not mistaken, to Stalin. Below are some examples, from Glenn Beck, with whom you are now doing interviews, as I understand it. "a level of moral demonization [that] is dangerously over the top." Here and here are links to Beck indirectly comparing Obama to Hitler or, in this case, a generic unhinged dictator. These comparisons are even more direct than the one you are wringing your hands about. If Bezos' program is so dangerous, than why have you not only remained silent about very similar instances, and have even gone so far as to have recently chosen to work with one of the corporate media's masters of division and propaganda, Glenn Beck? In other words, why is it that you remain silent when Beck plays with fire but that "worries you" when Bezos does it? And, just for the record, my position has been, and continues to be, that just about all national politics and geopolitics is hopelessly FuBar, and that PP will truly live up to its mission statement when it turns away from these divisive topics. BTW, students and I made a hugel in the school garden this year that actually worked (sort of...I still have a lot to learn). I'd love to hear more about your garden and less about your often inconsistent take on politics. I realize that's probably not going to be the direction you choose, but your mission statement will not even be approached, much less achieved by continuing to wallow in the swamp of politics and corporate media. *If you can accuse Bezos of taking sides simply by airing a show about fascism, it is perfectly legitimate to point to the times when you have called out some parts of the corporate media while choosing to work with other parts, such as Beck and Russia Today. Indeed, you yourself have repeatedly reminded your readers of the existence of white nationalist, fascist-leaning elements of the Maidan government in Ukraine while never mentioning the fact that threads of this type of fascism also exists in Russia. Any real geopolitical analyst of the Russia-Ukraine tension is aware of this, yet you do not mention the existence of fascist and anti-semitic groups in Russia that are supportive of Putin (example link here). I work with both Russian, Ukrainian, and Kazakh students and I have seen various instances of open anti-semitism by members of all three countries. Just focusing on Ukrainian anti-semitism is an example of your biased analysis, the very thing you claim to be qualified to warn us against. interesting comment hugh, thanks for posting. i will second the part of your comment where you mention that political talk is unhelpful and unproductive, and i'd like to see peakprosperity remain focused on the 3Es and away from political nonsense. however, i think chris was right to take bezos to task for his being an instrument of the deep state. this isn't a political position. we should be aware that bezos is bought and paid for, with a juicy $600 million CIA contract. the man knows what side his bread is buttered on. and there's nothing wrong with chris doing an interview with beck to spread the peakprosperity message to beck's not insubstantial audience. it shouldn't be interpreted as condoning beck or all of his beliefs. or do you take the divisive position that one should only speak to people with whom one agrees 100%? and there may well be room for criticism of beck, i'm not familiar with him, but the time that you reach out to him and his audience, is probably not the best time to put forth such criticism, that is counter-productive. Hugh was that question sarcastisc? or just disingenuous? Your challenge to Chris regarding calling "out some parts of the corporate media while choosing to work with other parts, such as Beck and Russia Today" is misdirection based on false equivalence. The equivalent question to ask is, given the opportunity, would Chris work with Jeff Bezo's Washington Post to reach their readership with the PP message? I suspect the answer is yes. There is not enough digital ink or time to call out every instance of Godwins law in the media or malfeasance in governments and societies. that doesn't delegitimize calling it out when it is topical and relevant to a discussion at hand. Your insistence on equally weighting the presence of fascist elements in the Russian society( which Putin's government has disavowed and prosecuted) with Chris' earlier analysis of the active role of similar elements in the US supported Ukraine coup is not only falsely equivalent but irrelevant. Indeed Chris didn't mention that those same elements exist in the US or just about every country on earth either. That doesn't change the fact that the US government / Obama was on the side of the fascists in that situation and Putin was on the side of the persecuted and Russia's legitimate regional and historical self interest. Your critique of Chris' Geopolitical analysis, is to my mind just a petty assertion of your own political leanings and biases rubbed raw when Chris's take on world events doesn't coincide with your world view or interpretation of events. Your scolding Chris to censor himself and abstain from Geopolitical analysis on his own web site is as nonsensical as the justifications you cite in support of your argument. I will give you marks for consistency though, as it is congruent with your previous attempts to censor discussion here and I'm not surprised to see you return from your commenting hiatus only to pick this same bone. Geopolitical analysis and discussion of governmental media and political machinations are integral to how we will experience the effects of the three E's indeed to how they will be manifested and distributed in our society. I value Chris' analysis in this regard and welcome discussion and intelligent debate on those topics. I give him high marks for doing this in as non partisan (left right) approach as possible. Thank you Hugh for once again expressing the many ways in which you feel slighted and emotionally wrought over the content decisions of this site. May I once again apologize for not delivering precisely the content you prefer and in the exact order? Clearly you deserve to have things exactly your way at all times and I should know that by now, and my failure to respond to your many long missives of discontent is a clear mark that I am being stubbornly obstinate and purposely not taking your emotional needs into account. I shall also apologize for not having thought Brexit would pass, which is a true mark of analytical shame, me being practically the only person who thought it would not pass in the entire world. Clearly if one cannot predict everything geopolitical with 100% accuracy, one should entirely refrain. Finally, the fact that I continue to trust my own experience and insights and track record over those of a teacher from an elite, foreign high school who only occasionally drops by to passionately and wordily criticize me must be truly vexing and troubling to you. It is indeed an upsetting mystery that I promise to look into. In the meantime, may I leave people with this...you may, of course, form your own opinions. I very much value what Chris and his entire group of guests has to say about geopolitics. To me, his thinking is incisive and centered in a broad global context in ways that others are not. Many are simply brilliant and explained with great clarity. Same with the writing of DaveF, Dave Collum, CHS and Adam. Along with many regular and guest posters. I do understand that not everyone will agree with everything. That is just the way it is and is 100% fine. People who disagree should feel welcomed to not read an item. Or to read and bring other information to the discussion. Or to add to the discussion as more information becomes available and evolves over time. What doesn't work are criticisms against the person. Hugh's post above is an attack on the person. you may only talk about the issues that I approve of. I wish to control the content of your writing. Therefore you are just like Adolf Hitler and I am so angry with YOU for what HE has done! As a bit of a nautical buff, I've always been interested in better understanding the events surrounding the attack on the USS Liberty (AGTR 5). Curious as to any thoughts you might have on this topic? IN JUNE 1967 jet aircraft and motor torpedo boats of the Defense Forces of the State of Israel brutally assaulted the American naval intelligence-gathering ship, USS Liberty, while in international waters off the coast of the Sinai Peninsula in the Mediterranean Sea. The attack was preceded by more than six hours of intense lowlevel surveillance by Israeli photo reconnaissance aircraft, which buzzed the ship as low as 200 feet directly overhead. The carefully orchestrated assault that followed was initiated by high performance jet aircraft. This was followed by slower and more maneuverable jets carrying napalm, and was finally turned over to lethal torpedo boats, which blasted a forty-foot hole in the ship's side. The attack lasted more than two hours, deliberately killing 34 Americans and wounding at least 171 others. Over 821 rocket, cannon and machine gun holes were inflicted. When the Liberty stubbornly remained afloat despite her damage, Israeli forces machine-gunned her life rafts, firefighters, stretcher bearers, and sent troops carrying helicopters to finish the job, no survivors were to be taken. On my planet it's perfectly reasonable if someone has examples to illustrate a concern they're expressing. In fact, I'd take their concern more seriously precisely because of the examples. slighted and emotionally wrought over the content decisions of this site. Sigh ... that isn't exactly a shining example of learning from someone else's perspective. Hanging around PP is like panning for gold in a Yukon river: there are valuable nuggets to be found but ya gotta be able to process the sludge. For me, Peak Prosperity is about making connections. Were the 3 E's acting upon us in isolation then it may be possible to run a site solely dedicated to their respective disciplines. The problem is that life isn't that tidy, these items cannot be contained in neat, little boxes, they crossover. In fact, entire systems are organised around the principle of resource distribution in the forms of either capitalism, socialism, feudalism, tribalism or theological lines. Take the medium of exchange as an example - the entire concept of monetary creation is a political question - i.e. who has the right to do it? If people are narrowing their perspective regarding the 3 E's perhaps it would serve as a challenge for them to run a competing website without reference to any type of state or privatised mechanism. Take something as simple as water. Who gets to distribute it? The state or private organisations? Who regulates the price? The market or regulatory committees? These are all real questions that require real solutions. You'd soon realise the impossibility of what you are asking. Take something as simple as water. Who gets to distribute it? The state or private organisations? Who regulates the price? The market or regulatory committees? These are all real questions that require real solutions. You'd soon realise the impossibility of what you are asking. It could even be something as simple as those who depend and work the supply decide upon the means of distribution. Possibly as a 'third alternative', i.e. local ownership. Plus those dumping waste in it would hold themselves accountable for the quality of the water based purely on the fact that it would be they who drink from it. Perhaps the problem lies in the fact that our economy is a dissipative system - that is, it's almost like 'fire and forget'. Produce waste, dump it somewhere not on your doorstep, go make some more waste. to whom is the debt owed? This question used to confuse me: its the Krugman thesis - "we owe the debt to ourselves, so it doesn't matter." This is accurate if you lump everyone into one pile. But zoom in. Who owns the debt? Who gets those interest payments? Poor people? Middle class? No. These are the people who owe the debt. Largely, its the rich - and the pension plans - who own the debt. The rest of us owe it. CHS had a nice graphic on this - perhaps he could be persuaded to cough it up. So next time you hear Krugman talking about "we owe the debt to ourselves", ask yourself, are you a member of the group "we", or are you a member of the group "ourselves"? Those who are in "we" are in debt slavery to "ourselves." And just from the standpoint of "ability to consume", the more debt "we" owe, the less discretionary income "we" will have. Add to that the steady reduction of the wage percentage of GDP over the last 15 years, as well as a declining employment-participation ration, and you've got increasing debt burden, and a rapidly declining effective income. But that's just for the unfortunates in the "we" group. The "ourselves" gang are doing great. And this guy won a Nobel.